On April 19, Shutts & Bowen hosted the Women’s Fund: April Women’s Voices Luncheon in the Miami office. Since 1993, The Women’s Fund of Miami-Dade improves the quality of life for women and girls in Miami-Dade County through advocacy, funding for innovative initiatives that build equality, foster social change and create community partners. 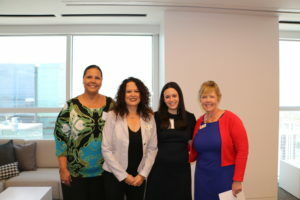 The Women’s Voices Luncheons are held each third Wednesday of the month where members and future members have the opportunity to network and learn more about the organization. Associate Shara K. Scottland is a member of The Women’s Fund. To learn more about The Women’s Fund, please click here. Shara K. Scottland is an attorney in the Miami office of Shutts & Bowen, where she is a member of the Real Estate Practice Group. Shara represents for profit and not-for-profit developers in affordable housing matters throughout the state of Florida. Shara has experience handling commercial and real estate finance transactions and corporate matters, including commercial, securities, real estate and EB-5 transactions.